At the vineyard house, Kate is eager to help her cousin clean out the enormous basement that is filled with generations of discarded and forgotten belongings. Deep inside the cellar, behind a large armoire, she discovers a hidden room containing a cot, some Resistance pamphlets, and an enormous cache of valuable wine. Piqued by the secret space, Kate begins to dig into her family's history-a search that takes her back to the dark days of World War II and introduces her to a relative she never knew existed, a great-half aunt who was a teenager during the Nazi occupation. Drops of Gold--les gouttes d'or: That's the name of the wine Kate's family has been making for generations. But Kate's life in San Francisco is half a world away from the French vineyard her mother turned her back on a generation ago, and Kate has instead spent years building her career as a sommelier. If she has also carefully avoided Burgundy vintages, that has been an acceptable weakness--until now, when she is facing her third and final attempt at passing the notoriously difficult Master of Wine examination. And so Kate returns to the vineyard, ostensibly to help her cousin Nico and his wife Heather with les vendanges--the annual grape harvest--and brush up on her knowledge. Her unspoken goals are to avoid as best as possible both the bittersweet memories of her childhood and Jean-Luc, a neighboring winemaker and her first love. What Kate does not expect is to discover behind a false wall in the basement of the vineyard house a secret room with a cot, World War II Resistance pamphlets, a hidden stash of invaluable wine, and the belongings of an aunt she never knew existed--Hélène Marie Charpin, who was a teenager during the Nazi occupation. As she learns more about her family, her long-lost aunt, and the reality of life in Vichy France, Kate also finds that the line between resistance and collaboration is razor thin. And she becomes consumed with a new goal for her time in Burgundy: discovering who, exactly, her family aided during the difficult years of the war. 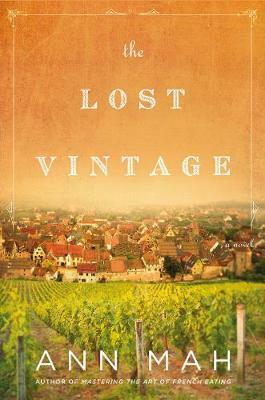 Told with elegance and deep compassion, The Lost Vintage is an unforgettable tale about balancing the ideals of courage with the harsh realities of survival, sustaining love for family in the face of shattering disappointment, and reconciling the deeds of the past with the values of the present. Ann Mah is a food and travel writer based in Paris and Washington DC. She is the author of the food memoir Mastering the Art of French Eating, and a novel, Kitchen Chinese. She regularly contributes to the New York Times' Travel section and she has written for Conde Nast Traveler, Vogue.com, BonAppetit.com, Washingtonian magazine, and other media outlets.